Dining: First, don’t do it very often! Take the time to plan a menu in advance, schedule easy meals on busy nights, and take advantage of special offers on the rare occasion you do go out to a restaurant. Kids Eat Free nights are especially helpful for larger families as you can usually get up to 2 free meals per adult entree. Many adult meals are easily shareable among children, at a lower cost than multiple kids’ meals. Travel: Embrace the road trip, my friends, because flying with a lot of children is going to cost more than your house! With excellent car sleepers and a night owl husband, we typically drive overnight to minimize stops, food expenses, and whining. I also pack snacks, a cooler full of water, and caffeinated beverages for the driver. When staying in a hotel, request a cot in a double room, rather than a 2nd room. It sleeps one more, but there is rarely an added fee. You should also look into rental houses as well because they often have extra bedrooms, sleeper sofas, and space for larger families. Clothing: Hand-me-downs can be a sore subject with children coming out of orphanages or foster care. Careful consideration of a child’s preferences and fit when thrifting can minimize their resistance. Older kids especially are very conscious of brands and condition of clothing. Try to balance new purchases with good quality consignment and thrift store purchases of favorite brands and basic pieces. We tend to gift new items, then fill in with hand-me-down and thrift purchases through the year. School supplies: We have four kids in school — that’s a lot of school supplies! I took advantage of sales and will actually buy more supplies next month when they begin to clearance. I also bought bulk supplies for the first time this year. The kids had a total of 80 pencils and 26 glue sticks on their supply lists. I shopped Costo, divided up the supplies, and sent each kid to school with the items they needed. After-School Activities: Sports, dance, band, clubs — we’re pulled in four different directions, and the wallet takes the biggest hit. One thing that has been helpful is to save equipment, shoes, and clothing to be passed down. I also shop thrift and consignment for these items. Cleats are especially easy to find in nearly new condition for $5 or less. As for the fees themselves, it helps to keep kids enrolled in similar activities. Signing ours up for sports in the same league saves us up to $50 per season with multi-kid discounts. Groceries: Growing kids need a lot of food! Ours would snack all day if we let them, which resulted in a pretty expensive grocery bill this summer. Instead, set out approved, healthy foods in reasonable quantities. I’ll never let a kid go hungry, but there’s a difference between eating healthy foods because they’re truly hungry and eating an entire bag of chips because it’s there. Over the summer, we packed snack boxes with healthy selections the kids could ration throughout the day. Now that school is back in session, I have fruit, vegetables, cheese, or boiled eggs ready when they get home. 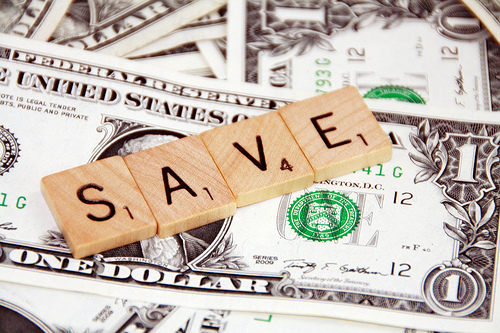 You can find more about Heather at HeatherSokol.com and more money saving tips from Heather at Inexpensively.com.